you should also read at least once the Code of Conduct before turning away new users from Stack Overflow. The question asked here is far from perfect but voting to close it (or even downvoting the question) is a fine way to turn away a newbie from "these arrogant ****** from SO"
What is the reason for downvoting my Question? Are you following the code of conduct? To the downvoter: at least have the courage to make clear who you are and why you downvoted it. Or offer a better alternative. Have you missed the new Code of Conduct? It seems the famous StackOverflow Code of Conduct does not stop people from downvoting questions they don't understand themselves. Not sure why this was put on hold. [...] Making this a very valid question. I feel the question was closed by people who do not know [...]. Nor is the fact it was closed without further explanation/comments against the new code of conduct. OP only has 6 points to his name, a little courtesy would have been nice. Downvoters and close-voters - stackoverflow.com/conduct . This is not a judgement zone for people making silly mistakes. I'll admit this was a very glaring oversight on my part. I thank @_____ for helping me instead of downvoting. [link] Of course there are some bad apples. Just as there's this small very vocal community of Stack Overflow Haters who post all over the internet about how offensive Stack Overflow is, there are also a few members who get their kicks by trolling people and being rude to them. But lumping all of us Experienced users into the same group as those people and telling us that we're being unwelcoming, that we don't understand the code of conduct, that our moderation techniques are harmful, while at the same time validating the people who claim that downvotes are personal attacks and that closing a question is offensive... Well that hurts. And it's very discouraging. In fact, such an accusation sometimes feels like a breach of the CoC itself, since the accuser is not "being open when receiving feedback", and so not contributing to a positive exchange. On the other hand, I would not rely on flagging all of these occurrences as "unkind" either. I understand that the code of conduct was the outcome of multiple iterations with community feedback, but some issues cannot be predicted without being already in effect. I cannot help but wonder whether it can be updated to address this concern. Rather than Band-Aiding over each of these comments with a "no longer needed" flag, it would be nice (no pun intended) to fix the underlying problem in this document. Is this issue worth acting upon? How can we prevent the code of conduct from being used like a verbal shield against constructive criticism or moderation mechanisms? "Flag as Harassment;Abuse / Move ON" is the new "Vote / Move On"
I for one have been complaining about the old Be Nice policy being weaponized by people that are passively aggressively publicly shaming down voters and others for doing what they earned the right to do, anonymously moderate the site. And I am on the record stating many times that the infamous Blog Post was just emboldening those people and validating their abusive behavior every chance I have gotten on meta, in comments and answers. So to say who knew? who could have saw this coming? is disingenuous at best, because the answer is, well pretty much everyone. In one particularly nasty episode here on meta where someone was disparaging me by name and claiming I did and said all kinds of malicious things by intentionally attributing "quotes" to me that I never made by editing and taking them out of context, their defense of this attack on my character was repeating but I am being polite. Thankfully I had screen shots of the comments before the mods deleted them and was able to defend myself with facts. This person was claiming they were the victim and that they were being polite and only one person came to my defense and stated the obvious, paraphrased that you can be abusive and be polite about it and it does not change the fact that you are being abusive. The fact that this new code of conduct as been further weaponized is not surprise to me and just further reinforces the vote/move on/never comment mantra now. I make a point of flagging every comment anyone makes that even remotely could be considered in bad faith no matter how polite they are about telling you to f#@4 off if you have no intention of answering as abusive, because it is abusive to everyone that reads it and promotes a toxic entitlement attitude that has gotten more and more pervasive as well. All I can say, is to do the same thing, because the popup says "your flags are taken seriously", which I can only infer to mean they are tracking them and doing some analysis on them and might take some action when they see what everyone else that is telling them is happening. 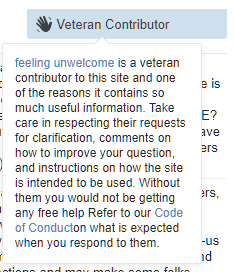 StackOverflow is unwelcoming to veteran contributors even more so than ever, do you know how you can tell? So those of us that are withdrawing our active support of the site more and more by just not participating are doing it more and more silently, because we are telling you and you are not listening. But you will never see anything even remotely like this implemented. The next logical step to vote/move on is move on to something more appreciated and more productive and unfortunately that is becoming more and more inevitable by the day. Servy makes an excellent point that this sort of behavior was pointed out to the stewards of the CoC before the implementation went live. In fact, I do distinctly remember pointing this very thing out (amongst other people). The Code of Conduct makes it seem such that anyone who feels that they've been wronged by someone in comments is fair game to get punished by the system. And that's fine...if they actually were wronged. The only real thing we can do is nothing. Reacting to any comments like this would only start a flame war between you and the other person, and it just isn't worth it. Ironically, this is usually how fights were started with the old CoC, since users who feel like they're just trying to help the site out with some moderation would inevitably make a comment to someone else who felt like said moderation effort was offensive and demeaning to newbies. Leave it alone, man. This ain't worth it. This all seems to be very much in line with the moral panic sweeping larger parts of the culture. Trigger warnings, safe spaces, political correctness, micro aggressions etc. pp. If you feel insulted, you're entitled to feel insulted and the aggressor is always in the wrong. If there's a writ you can wave around in your defence, all the better. This isn't isolated to just Stack Overflow, it's a larger cultural phenomenon. Arguably the entire Welcoming campaign is an outgrowth of this. And even with all the changes being made to accommodate and be welcoming, it's simply never enough. Unless and until everyone gets exactly what they want, which is pretty much "I post whatever I want here, I get exactly the answer I want", this isn't going to stop; which means it won't stop. People are endlessly imaginative when they have to find a way to get what they want. Shaming somebody else is something we all learned from the age of ~4, whether from dealing with an older sibling or from kinderschool. Somewhat predictably, the new CoC is just another weapon in the arsenal. Useful in particular to anybody that can't get what he really wants, an answer to his crappy question. I've been trying to find an explanation to this new approach, tabling the complaints about anatomy and skin color never once made any sense to me. I thought it had something to do with the relentlessly decreasing success of the web site, the reversal of the number of page view statistic last fall makes any web site owner nervous. But that didn't make all that much sense either, given that the real problem is that Google no longer indexes SO content and the [welcoming] approach did absolutely nothing to reverse the trend. I fell off my chair when I accidentally visited this web site while researching a meta question. Been around a long time, used to be the frontal for a game, but recently acquired by Joel Spolsky. Check it out, the message is quite thickly spackled on and hard to miss. Wow, the web's misery is a business opportunity for a cynical entrepreneurial American. There is no shame when you make one more buck to show you're doing it better, the measure of accomplishment in the USA. We have to stop allowing them to push our buttons. This is our web site, we made it successful by ourselves and they had nothing to do with it. As a rule flag them as no longer needed, if they're rude/unwelcoming then use the other flags. Don't make the goto flag be rude/unwelcoming. What people need to realise is the Code of Conduct is not just for the longer term community, it's for new users also. Sometimes it's like an Learner driver going onto the road for the first time yelling out the window at other drivers for not giving way at a roundabout, when in fact it's the L plater who's driving in the wrong direction. There's an irony in people making these comments and flagging innocuous comments as unkind or abusive. On unwelcome and rude flags, I go to the post itself and read the comment thread. Frequently, people who use the Code of Conduct as a weapon on other users will find themselves having their own comments deleted and I will leave them a comment. If the comment flagging persists they may receive a private mod warning. If you see comments you think are not ok, flag them. If you're not feeling patient with someone flag and move on. There's a mod there who can be your best asset and will take on the problem for you. That's what we're here for. If you find yourself writing comments telling people they're in breach of the CoC, delete and flag instead. That's what the mods are for. The referees to call our foul play. Another reminder Comments asking for clarification or an MCVE are not rude/abusive. While reading the question here it triggered for me another issue I have with some users that ties very well with the current topic: some users take down-votes as a personal attack. And this is one of the roots of the problem: you down-vote me - therefore you attack me - therefore you violate the code of conduct. I think we need to get the point across that down-votes are for the question and they help the community. Votes are a measure of how much a question is useful to the community. They have absolutely nothing to do with the user (those who have - e.g. serial down-voting - are corrected). It is very important to keep a metric of good/bad questions on this site, especially in the context of the high debit of new question and the new code should not be used as an excuse to circumvent this. A new question from a new user should be down-voted as easily as before if it merits the down-vote. The code of conduct is here to avoid harassment via snarky, condescending, ironic (etc.) comments. My suggestion is to improve the https://stackoverflow.com/conduct page with an added section explaining why down-votes and close-votes are important and how they are not personal and should be taken as a constructive feedback, not as a personal attack. The code should not be used as a carte blanche excuse for low-quality questions. I think this is a short-term problem. Anytime there's a new shiny thing around, people will try to use it for whatever they feel it should be used for without actually caring about its intent. However, since moderators are the ones with the actual power, these comments don't really matter. Users downvoting and close-voting appropriate posts will not be sanctioned. People stop using shields when the shields prove ineffective. As Yvette says, flag as "no longer needed"
One of the paradoxes of this theme is this: we've been through our own Meta cultural war to argue for and against CoCs, and regardless of where each of us stood on the issue, we now have that code. One of the objections to them was that hypersensitivity is encouraged in everyone, and that all complaints of victimhood must be automatically upheld. I don't necessarily agree with that criticism, but the "old guard" here must now not fall into that same trap. Thus, if we see a few cheap appeals to the CoC to defend poor questions, let us not respond with hypersensitivity or victimhood. Let us take one of the options above, and move on to the next question. If it turns out this is a significant problem, then perhaps we need to change the on-boarding process for new members, but for now, it is not really much to worry about. Any kind of criticism feels personal the less context it contains that could help to depersonalize it. I have been active online for few decades and received my share of criticism. I believe I have developed a thick skin to even handle the infamous Linux kernel mailing list, but getting an unexplained downvote (anywhere, not just Stack Overflow) still hurts very deeply. Why? because it makes me feel helpless. I don't know why my question, comment, or answer was downvoted. I don't know what I can do to fix it because the downvoters didn't give a reason. Now, it hasn't crossed my mind to use the CoC as a defense, and I most certainly won't do it in the future since, as someone pointed out, doing that can be hurtful too. But it doesn't surprise me that someone else would use the CoC in just that manner. As someone else pointed out, people do not realize that even polite criticism can hurt. I do not know if it is possible to adapt the CoC to handle this. Chances are that those abusing it didn't read it close enough and maybe think it's the same as any other CoC. The real problem I fear is that kindness can not be legislated, but must be learned. As yet another person observed, this appears to be a general social problem. We are trying to more and more legislate how to treat each other, but I don't see many trying educate people how to actually be more kind to each other. No one likes to be criticized. The only way to not hurt someone is to not criticize them at all; but sometimes criticism can't be avoided, therefore we need to recognize the effect our criticism has on others and take that into account. The degree of hurtfulness depends on how well the two parties know and trust each other and how public or private the message is. The least hurtful criticism comes from my most trusted friends in a personal conversation. I don't know how this can be translated to Stack Overflow. Obviously we can't just stop criticizing. There needs to be a balance somewhere between criticism needed to correct behavior, and kindness to welcome people to contribute. I called this out specifically during the discussion around the new CoC before it was live. You can't make an all-inclusive society. I found only one possible interpretation. He was complaining that he was unwanted because we couldn't make his thing work. We tried hard, yet he felt unwelcome because the result was bad. "Be welcoming" is inevitably turned as a cudgel against the more able. It's like people want to believe that a certain kind of fair should be involved that doesn't make sense. It's not the fair of justice nor equality of law but more like a belief that people ought to have equal potential, therefore, math* should bend so that they do. We need to stop wielding this as a cudgel. Most of the problems don't seem to be not understanding how the site works. Most of the problems seem to be from not understanding how to ask or how to answer. Yeah we got some real problems with some people posting rude comments. We've got more problems with people not understanding Wittgenstein's ladder and voting stuff down because the question isn't asked in the proper form when if the OP knew the proper form he would be really close to solving his own problem. For certain kinds of things, I took too long ago ignoring the fact the question almost certainly has a duplicate and immediately answering the question using the OP's own code as the example code for how to understand the problem. I got an awful lot of zero score accepted answers, etc. that way. *I wrote physics the first time. It's a worse word choice but perhaps its easier to understand. I think this campaign trying to make the site more welcoming is an emphatic and pro-empathizing campaign that lacked some empathy in its implementation. I agree with @deceze that this campaign was put in place in response to what the world as a whole is worrying about these days. I won't list any names or point in any direction but there has been a lot of controversy as to how inclusive the Software Development community truly is, and how misguided certain efforts are, etc. So it makes sense that SE would worry about that too, and try to stay ahead of the curve. I think the problem here is that by saying we need to be more polite, they didn't point out that as a whole many many many people in here are truly polite, and at is core many people here are here truly only to help other people, which is a really noble, and polite attitude. But let's play devil's advocate, maybe they didn't feel the need to point it out, because for them it is obvious? In the same way when you answer someone something "negative" or down-vote, you don't need to tell the OP "this is nothing personal, I am grading the content, not you". They didn't feel the need to say many people here are polite. They sent a lot of surveys about this, so unless you assume evil/foolish intent it is safe to assume that many of the changes were drawn out of those surveys. So it can be safe to assume many people do feel unwelcome here. OR it could be a case of serious misrepresentation where many veteran users didn't answer the surveys? I doubt it. I never felt unwelcome because of my gender or race, although I haven't disclosed it much, so can't tell the experience others may have had. However I have felt unwelcome, and I have felt some users have been rude to me (when this happens I usually verify it with someone else, since English is not my native language and sometimes it could be that I misunderstand something, and my native English co-workers/friends agreed with me that the SO user was being impolite) As general rule, though, there is going to be people out there in the world, in life, that are not going to be polite, so it didn't send me crying or make me feel betrayed. However cultural differences, and life experiences can exacerbate this bad experiences for some users. But let's be realistic, I know for a fact there has been certain cases of impoliteness that have been blown out of proportion (I recall there was a veteran user that got into an argument with an OP and then the OP decided to take it to Reddit and then everything went to hell), but they were true cases of impoliteness that sadly received too much visibility. Sadly, in this world impoliteness/rudeness/evilness, receives more press, because usually people are more inclined to read about that or more interested on that. I have something to say to the people that don't see there is a problem on the site with discrimination of different groups, it probably means you are really nice. I have noticed throughout my life that many of the most sweet and nice people actually are blind to certain discriminatory issues, because for them is totally illogical to be being mean to someone, or disregard someone's contribution based only on their race or gender. So they are blind to other people doing it, and find it hard to believe. But it exists. For example, being a woman in a IT can be extremely hard, when there are men(and woman) out there that will disregard your contributions or anything you say because you are probably just being hormonal, because you are in "those days". I repeat, I haven't suffered that kind of discrimination in SO, but I haven't in general disclosed I am a girl, so I can't tell if it does happen in SO, but I can assure you it happens on day to day jobs in IT, and many girls wind up stirring away from technical assignments towards more "human" assignments to avoid that kind of things. However, this has never led me to believe every men is a jerk and that all programmers are misogynist. Because that would be illogical. But it is what some people do to weaponize these kind of campaigns. We all have biases, we need to understand this, and accept it, and embrace it, having biases, making mistakes, even sometimes being impolite, doesn't make anyone evil, or a piece of trash, it only makes you human. Asking people to be polite, is not telling people they are not. In a community so large as this, is not practical to send every single person a personalized message. Even then what is perceived as polite can vary a lot from person to person, from culture to culture. So take it as a friendly reminder. And don't allow them to weaponize it. In my personal opinion, it has been always a sore spot to receive a down-vote without a reason, I don't need to know who down-voted my post, but if I were ever to improve I need a definite reason why my question is wrong, not esoteric machinations (the ones I imagine trying to understand what is wrong with my question, heh!). As it has been pointed out in many places down-votes are not ill will, just a mechanism, and the reason they don't force users to put a reason, is because the questions should be down-voted for the reasons listed in the rules, etc. However not everyone follow the rules, and it has happened to me that I ask "why am I getting down-votes, what do I need to improve?" and people (in this site) told me "nothing", so I was breaking my brain in vain trying to understand something that couldn't be understood. I think those down-votes without a reason are the reason many users feel un-welcome, imagine in real life if you were in a relationship, and the person dumped you without saying a word, just vanish, but you knew they are sound and well, just not talking to you any more. Is just maddening, however I understand the reasons and position of SO users that don't want to force users to place a reason, due to the sheer volume of poor questions, it would be impractical to force them to have to select something that is obvious for the most part. However, not everyone has the predisposition to try and understand the reasons why something is done in certain way. And in certain cultures, that kind of thing feels even more violent because there is no way in their mind a site would actually allow/promote/encourage such kind of behavior (because they have the "you ought to give a reason" mentality). Also someone here pointed out they wanted SO to be for professional programmers, And I wonder, what does that mean? Many non-professional programmers do great questions, and I have seen in my every day life so called "professionals" that are lacking in basic professionalism. We shouldn't label people, we are here to judge content, not people. Finally, there is always going to be people that abuse the rules, is just part of human experience, some people abide to them like crazy, some try to interpret them and follow them the best they can, and some will pick anything that may favor or that they can twist them to abuse them. With everything I said in mind, I advise you not take anything personal, there are here lots of people that actually appreciate what the most veteran and knowledgeable SO users do. I think, I speak for many when I say that I appreciate the help the community has given me in a technical level, and also when the people like @Servy offers his opinion and guidance on how to use the site. I also advise, to keep an open mind, the people that felt mistreated may have a valid point, there could be something, certain users can do to improve. If someone tries to abuse the CoC we just need to use the rules and the CoC itself to answer them. We shouldn't engage in arguments with these people, some of them may be just trolling. But we need to try and be polite, not because of SO, but because in general, the world is a better place when we are nice to each other. And try to understand that even when you tried your most to be nice and polite, someone may feel mistreated anyway, because of their life experiences or who knows why. And there is not necessarily anything you could have done different. If the OP is as extreme as to quit SO forever based on a single experience, that was in the frame of the rules, because he felt unjustly treated, and he is willing to deprive himself of the valuable information and help he can find in this site, then that is the OP's problem, and there is nothing we can do about it. But if the OP felt unwelcome because the other users were making qualitative comments about them and their attitude, then that is our loss. If someone is trolling, or insulting others, we shouldn't engage in argument, I would point to the CoC and then proceed with the tools of the site. If the OP post an awful question and points to the CoC as a shield, just ignore it, that behavior amounts to children's "but it is unfair". We don't validate children "it is unfair" attitude by arguing with them at their same level. Lets follow the adage "chose your battles". As it is, I worry more about the sheer volume of bad questions, that never seems to diminish. I for one when I tell a friend about using SO, I explain him how to use the site properly, but also tell them not to feel bad if someone seems rude in the way they point out you are doing something wrong. That one person shows impolite behavior doesn't mean the community is rude as a whole. I tell them to search thoroughly and try different things, and just then if they can't find anything to post a new question. To try and help with that issue, by preventing future poor questions. Not the answer you're looking for? Browse other questions tagged discussion flags comments moderation code-of-conduct . Does “Time to take a stand” adhere to the Be Nice policy? Any idea what to do when an off-topic question gets enough upvotes to counter downvotes? With the new CoC: will links to idownvotedbecau.se be considered rude? How can you reach the Code of Conduct page other than the announcement banner on top? Is the current wording of the Code of Conduct too extreme? “Why downvoted?” comments - unfriendly according to the new Code of Conduct? How do you approach or salvage a question with sexist overtones?